Writers: set aside Word! There's a better way! When the first version of Ulysses appeared five years ago, it caused a stir with writers. Good though apps such as Word are, they have limitations as they focus on creating individual, linear documents, and there's a tension between ease of use in just bashing down words, and how much time you waste fooling about with fonts and page layout concerns. Ulysses, by contrast, removes styling altogether but you can use a kind of markup language to tag sections with format-like styles, though the emphasis is more on structure than aesthetics. This app throws you into the idea of a project rather than a document. A project contains as many documents as you like – but, you can't organise them into a hierarchy. Although the new Collections and Filters in a way exceed some of the functions of true folder-like hierarchy – and each document has a notes field attached. Documents can have statuses applied to them – draft, final, and more, including custom tags – and you can use one of the panes to see other documents and notes while still working on another. Or, if you prefer, Full-screen mode removes distractions. The new version adds flexibility and is easier to access. Little additions, such as bookmarks and screencasts make the whole package feel tighter, and bigger things – such as projects templates – are welcome. 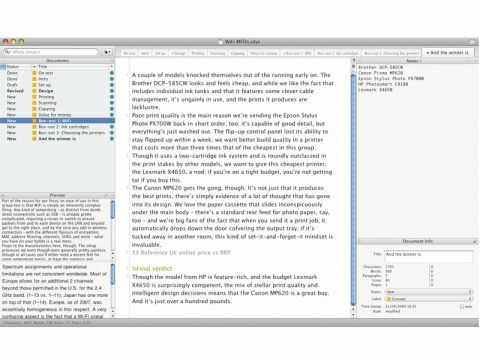 Still, Scrivener is cheaper and still just has the edge in terms of polish and ease of use.